Pharmaceutical - Audio Visual Rental Services, Inc.
We service many pharmaceutical representatives, physicians, and hospitals. (See our client list). The majority of the pharma reps perform ‘Power Point’ presentations in private rooms of fine restaurants in the Philadelphia area. We will have our equipment set up and ready for immediate use upon the reps arrival. In emergencies our rapid response time has often ‘saved the day’ when the presenting doctor has neglected to mention all of his audio visual needs in advance to the pharma rep. In most cases, we can be onsite within 1-2 hours of your emergency phone call. If you don’t have your own LCD projectors, AV Rental Services, Inc. has designed a ‘Headache-Free’ rental package. 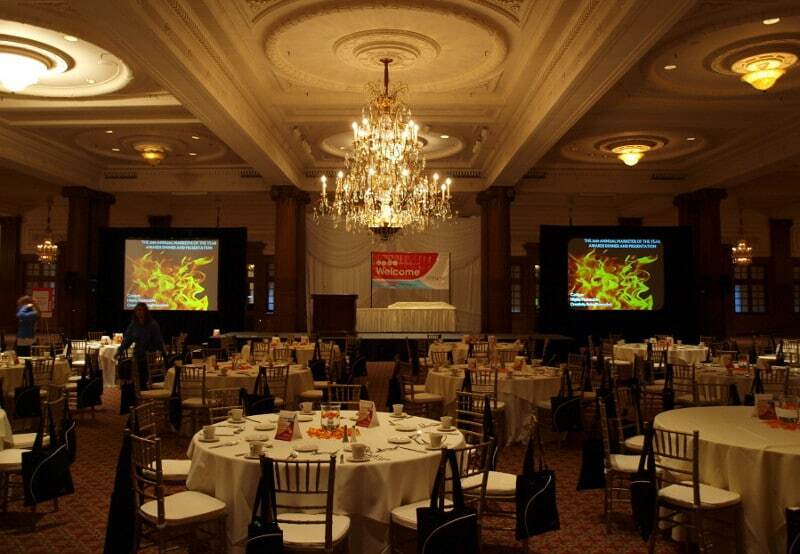 The ‘Headache-Free’ rental package includes everything required for a flawless presentation. – LCD Projector, Screen, Wireless Presenter, and/or Small Sound System and Microphone from $150-300.00. This leaves the rep available to focus on more pertinent issues. Currently many pharmaceutical reps own their own LCD projectors. We can still assist in two instances. Most representatives will not bring their own projection screen and we accept many ‘screen only’ requests. Secondly, often the presenting laptop will have a connection (HDMI) that the rep’s laptop can not accept and we can provide an appropriate projector in this case. Recently we provided an LCD projector, tripod screen, sound system and wireless lavaliere to Fogo De Chao for a Merck Pharmaceuticals Representative. After leaving the restaurant the driver received a phone call from the Merck rep. The presenting laptop crashed and could we help. Our driver had an AVRS laptop in the van, returned to the restaurant, set-up the laptop and subsequently ‘saved the day’. For pharmaceutical companies owning AV equipment and/or having an In-house Audio-Visual department, AV Rental Services, Inc., can provide hard-to-find equipment, equipment not stocked in-house or supplemental equipment when a company’s demand outweighs the in-house AV supply.